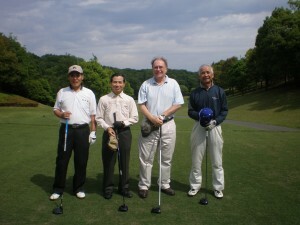 Australian Ambassador’s Cup golf competition was held at Camellia Hills Country Club of Sodegaura City, Chiba Prefecture on May 11, 2010. 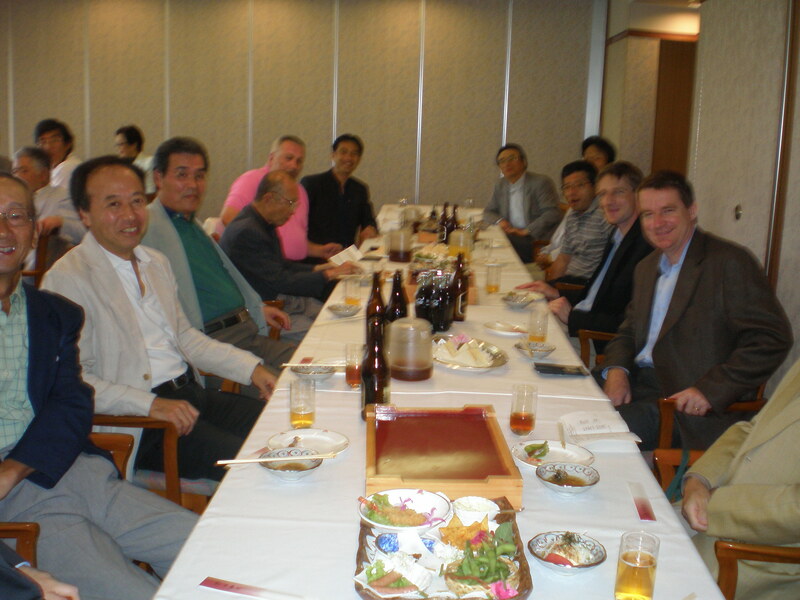 The organizer was Japan Australia New Zealand Society, Inc. with cooperation of Australian and New Zealand Chamber of Commerce in Japan. The weather forecast was rain but umbrellas were not in use most of the day. 24 participants, including Australian Ambassador, H.E. Mr. Murray McLean, Minister Mr. Richard Andrews, New Zealand Ambassador, H.E. Mr. Ian Kennedy and Mrs. Kennedy, Mr. Masaji Takahashi, former Japanese Ambassador to Australia and President of JANZ Society enjoyed the Golf Day. The winner of the competition held under the New Peoria Handicap System was Ambassador McLean himself. 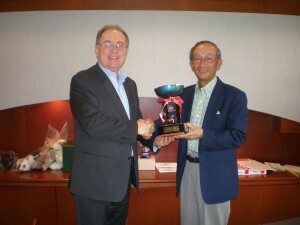 The Ambassador’s Cup was presented to Mr. Takashi Toshitomo who was runner-up. Third place was Ms. Mie Nakajima followed by Ambassador Kennedy and Mr. Hotta. Prizes were presented by Minister Andrews in place of Ambassador McLean who had to leave early. 1st to 5th, 7th , 10th and Longest Drive, and Nearest to Pin were awarded. 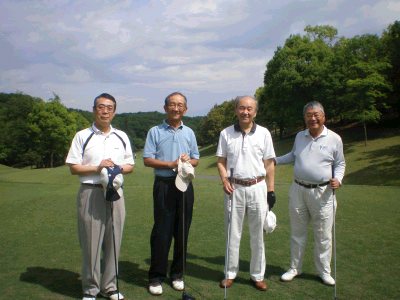 The best gross score was Mr. Toshitomo’s 81. Lady’s best gross was won by Ms. Nakajima’s 99 who also won a marvelous Longest Drive over male players. Ambassador McLean won a Longest Drive and a Nearest to Pin. 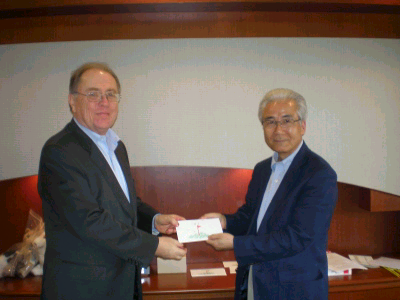 Other Longest Drives were won by Mr. Wada and Mr. Toukura. Nearest to Pins were won by Ambassador Kennedy, Minister Andrews and Mr. Wada. Next Golf Day will be in October for the New Zealand Ambassador’s Trophy. 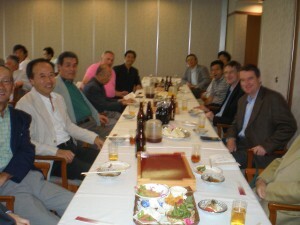 Christmas Party of Japan Australia New Zealand Society (JANZ) was held on December 9, 2009 at the Bamboo Restaurant in Omote Sando. Counsellor Peter Roberts and Counsellor Nancy Gordon from the Australian Embassy and Mr. and Mrs. Mark Pearson the Minister and Mr. and Mrs. Stefan Corbett the First Secretary from the New Zealand Embassy were the main guests together with Mr. and Mrs. Ueda, the former Japanese Ambassador to Australia, Mrs. Masami Suzuki, President of JANZ Ladies’Group and the JANZ members and guests who were 58 in all. The party began at 6:30 p.m. with the welcome drinks followed by the opening speech by Mr. Masaji Takahashi, President of JANZ and a toast by Mr. Ueda, the former Ambassador to Australia. 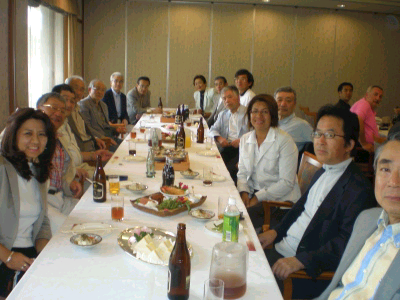 The guests from the Embassies were introduced by the MC, Ms. Sola Arai, Director of JANZ. Sitting full course dinner organized by Michelin 1 Star Chef was served with the Aussie beef and New Zealand lamb as the main dish. The New Zealand lamb was offered by the ANZCO Foods Japan. During the dinner Ms. Hoki Tokuda, former wife of Henry Miller, who was invited by the owner of Bamboo Restaurant, Mr. Takeuchi, played the piano and sang popular oldies and Christmas tunes which created the festive atmosphere in the room. Around 8 o’clock, professional dancing was demonstrated by Mr. and Mrs. Ito. Dance time followed after that and the dance floor was crowded by dance lovers, some of them partnered by the professional dancers. After the excitement of dancing, Bingo Game was performed by Mr. Hiroto and Ms. Higa. All the attendants bought 2 bingo cards. There were plenty of prizes donated by the Directors of JANZ and sponsor firms. 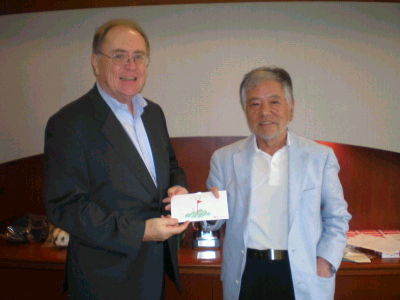 The premier prizes were three pieces of Obi donated by Mr. Ito, Director of JANZ and organizer of the Christmas Party. Bingo Game aroused plenty of excitement in the party. 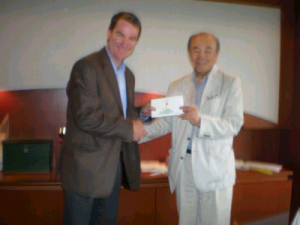 The next JANZ event will be the New Year Party which will be presided by Prince Katsura, the honorary president of JANZ, to be held at the Australian Embassy on January 21, 2010. Australian and New Zealand Ambassadors will be the main guests of honor. JANZ has received cooperation from the following organizations. 11a.m. and 2p.m. for the understanding and popularization of the sport. didgeridoo painting workshop and sales. ginger, fruit juice, essential oil and organic products at discounted price. 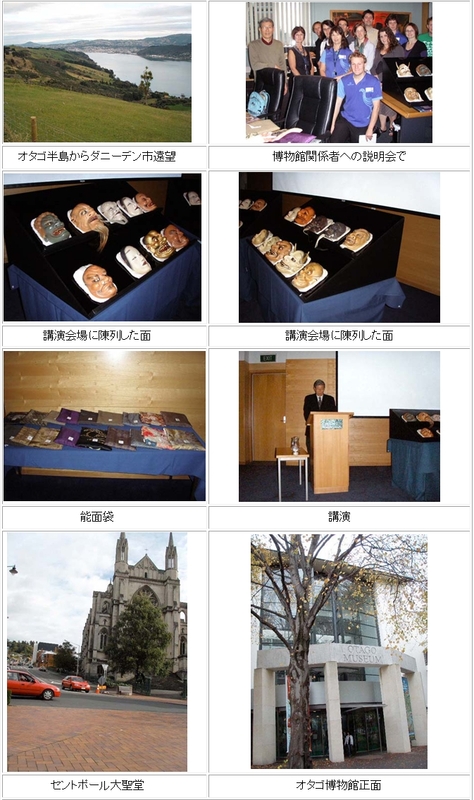 and culture of Australia and New Zealand in the core tent. We offer appreciation to the above-mentioned parties. and KOB’s products at special discounted price with premium goods. 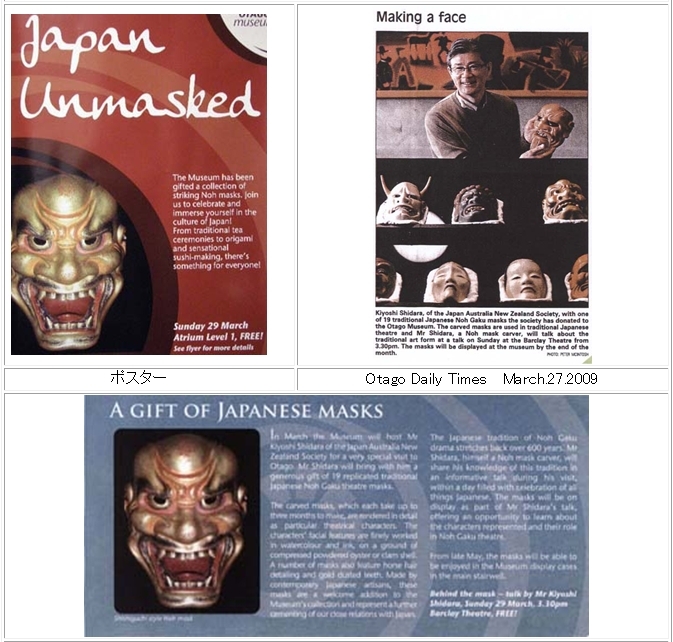 Non JANZ members can receive special favors if they bring this printed page.